I could research and write about postcards all day long for Papergreat. Let's see how many I can get through today. Fortunately, I find all postcards interesting, so it's by no means an expensive hobby for me. For others, it certainly can be. But I am not enraptured by Holy Grail quests for postcards that sell for hundreds of dollars at auction.2 Or those hard-to-find vintage Ellen Clappsaddle Hallowe'en postcards. Nope, the "commons," for those who would call them that, suit me just fine. And there's nothing common about them, to my eye. The unused card, likely from the 1960s, was published by Paul L. Patterson of 717 21st St. West in Bradenton. It was printed by Dukane Press of Hollywood, Florida. 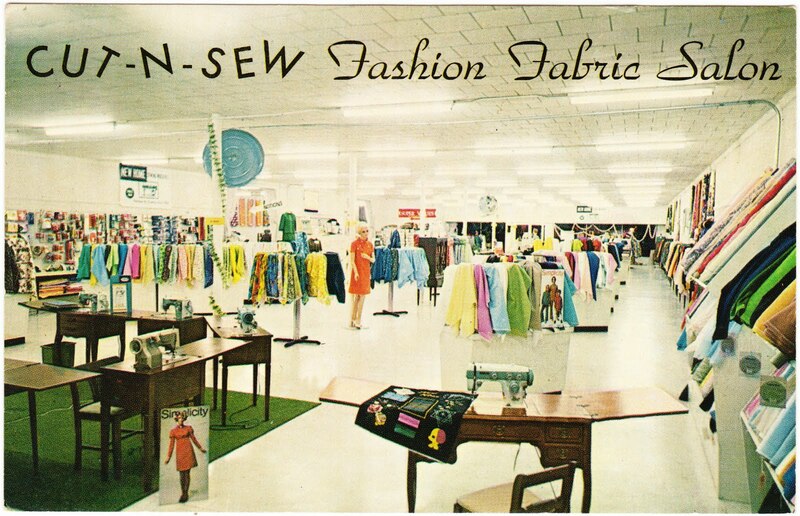 "Fabrics and patterns to make your own clothes were sold at the Cut-N-Sew Fashion Fabric Salon in downtown Bradenton in the 1960s. 'Come meet the friendly folks' was its slogan." I also found this newspaper article, which mentions Cut-N-Sew, in the February 23, 1971, issue of the Sarasota Herald-Tribune. At some point, the business might have changed its name to Gulf Coast Cut-N-Sew, and, in this 1974 Florida court case, Gulf Coast Cut-N-Sew is mentioned as being "defunct." Does anyone have any memories of Cut-N-Sew? If so, please share them in the comments section. 1. According to that Valuable Rare Postcards page, some of the biggest sales in December 2012 were for a rare, unused 1905 Philadelphia Athletics card ($600); a real-photo postcard of Main Street in tiny Adrian, Minnesota ($466); and a real-photo postcard of the Titanic leaving Belfast ($321). 2. U.S. 41 sounds like a great road to travel on. It winds from the upper peninsula of Michigan to Miami, Florida, taking you on a 2,000-mile trek through America. It's kind of a north-south version of Route 66. I miss big indy fabric stores. If you do a postcard blogathon, maybe I can do a postcard writing blogathon at the same time and finally catch up on my backlog of "waiting for reply" mail. I don't collect postcards as much as I collect connections. Doesn't really matter what is on the front as long as the message on connects me to the person who wrote it.